When I was a teenager, I used to keep my place in paperbacks with rubber bands. When I was reading, I'd loop them around my wrist then slide them over the pages and around the spine of the book when I wasn't. These are a bit prettier than that, but they work the same way. The little crocheted motif goes into the loop to close it around your wrist while you're reading, then you can just slide it into your book when you're done. It's a good stashbuster thread project, easily adaptable to any really small motif. They are small and quick enough that they might make good sellers for craft shows and bazaars as well. I never ch 1 and count the first ch as a stitch, I don't like how it looks. So I ch 1 tightly, then work a sc, so that's how the pattern is written. If you prefer ch 1 count as first stitch, do it that way. Round 3: ch 1, 3 sc in loop, sc in next stitch, 5 sc in ch 3 loop, sc in next stitch, 7 sc in ch 5 loop, sc in next stitch, 5 sc in ch 3 loop, sc in next stitch, 3 sc in first loop, ch 80, sl st into the 21 ch from hook (loop formed), sl st back down the chain, sl st to first sc to join. Break off and weave in ends. Round 1: 6 sc in first ch or in magic loop- sl st to join. Round 2: ch 8 (counts as first tr cr and ch 4),tr cr in next st,*ch 4, tr cr in next stitch,* repeat ** round, on last loop ch 2, dc in 4th ch of the ch 8. Round 3: ch 1, sc in loop 2 times, sk stitch, 5 sc in next loop, sk stitch, 5 sc in next loop, sk stitch, 5 sc in next loop,sk stitch, 5 sc in next loop,sk stitch, 5 sc in next loop,sk stitch, 2 sc in loop, ch 80, sl st into the 21 ch from hook (loop formed), sl st back down the chain, sl st to first sc to join. Break off and weave in ends. I hope you enjoy this pattern as much as I did. I made a half dozen of them during the Super Bowl. I think as a teenage bookworm I'd have really preferred these to the rubber bands. wow, great idea, if you put it on as a bracelet while reading, you don't have to search for it after reading !!!! I just found this through Ravelry. Brilliant idea! I am always losing my bookmarks and having to make more. This is a perfect solution to that problem - thank you so much for sharing your patterns! This is super! Thanks for sharing this pattern. 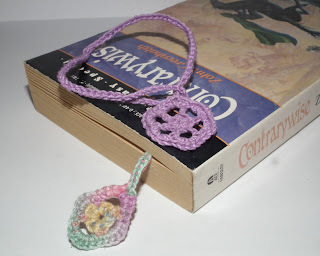 I just made one for myself and one for my son's girlfriend who loves to read! Shala, thank you so very much for sharing this pattern. I crocheted 50 as a fundraiser for my granddaughter; 30 more were gifts for my daughter to hand out at the hospital; and I have used about 20 more as gifts to my friends. Everyone just loves them. However, I made many, many different types of small flowers and emblems for the top motif. Before I packaged them they were all lightly starched for a little body. Really appreciate your work! Thank you so much. You absolutely made my week with this nice comment. Glad you're enjoying the idea and doing so much with it! I'm going to get to work on this now...the perfect solution! This is a great idea. I do a lot of reading. These are cute and convenient. I also think these will make great Christmas gifts. Is it possible to get a chart of these directions? I have a much easier time with a chart. These are great! Thank you for sharing this with us. My family all love to read, but end up using recipts or other scrap paper as a bookmark, as we all tend to lose the bookmarks we buy. Having them on our wrist at all times will help remind us where they went.